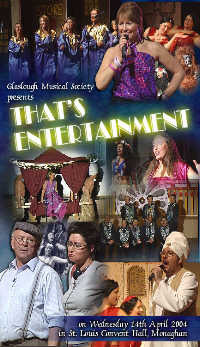 Formed in 1981 Glaslough Musical Society staged variety shows and took part in The John Player Tops and other such competitions through the 80’s and early 90’s. A generation of children, teenagers and adults basked in the musical delights of these dazzling performances, as songs, both old and new were sung amongst all the glitter, dance and comedy of a lively, energetic show ! Now Glaslough Musical Society are back after eleven years once more, with a number of former cast members and newcomers taking part. Sit back with this video and prepare to be transported on a “Magical Mystery Tour�? in a whirl of musical talent ! on Wednesday 14th April 2004.